Not only can this yeast produce the classic Extra Special Bitter (ESB) which found its fame back in London many years ago. But this yeast can also be used to make exceptional Ciders! 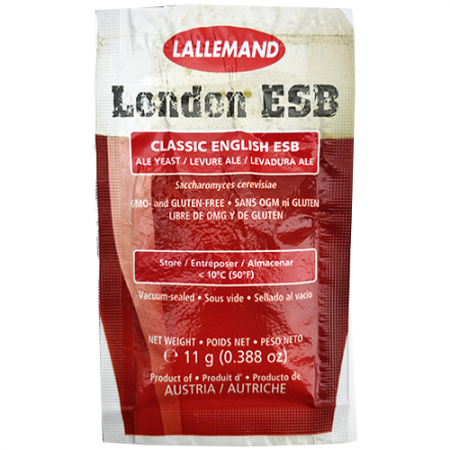 Lallemand's London ESB exhibits light flavours and aromas of fruit and ester, predominantly neutral in character which allows malt and hops to shine through. UK Heritage styles are also a must for this yeast, e.g. Milds, British Pale Ales ect. LalBrew® London is a true English ale strain selected for reliable fermentation performance and moderate ester production that lets the flavors and aromas of malt and hops shine through. LalBrew® London was selected from the Lallemand yeast culture library, and is an excellent choice not only for brewing Extra Special Bitter but for other authentic heritage UK styles like Pale Ale, Bitter and Mild. LalBrew® London may also be used in the production of Ciders. Classified as a Saccharomyces cerevisiae, a top fermenting yeast. LalBrew® London does not utilize the sugar maltotriose (a molecule composed of 3 glucose units). Fermentation rate, fermentation time and degree of attenuation are dependent on inoculation density, yeast handling, fermentation temperature and nutritional quality of the wort.